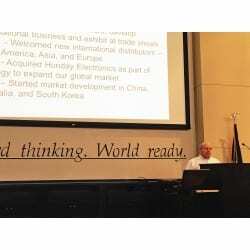 March 17, 2015 – George Eakin, President and CEO of Osborne Industries, Inc., presented a seminar to the attendees of the Northwest Kansas Regional Export Promotion Meeting on the campus of Fort Hays State University in Hays, Kan., on Tuesday, March 10, 2015. Eakin presented on Osborne Industries’ experience in exporting its livestock equipment products around the world. Eakin provided a brief history of Osborne Industries’ exporting business, including its first shipment of heating pads for baby pigs to Japan in 1979. Additionally, Eakin provided tips to those in attendance thinking of exporting goods or services from their business. Today, Osborne Industries, Inc., has exported product to 44 countries, including China, Japan, South Korea, Brazil, Germany, Sweden, and Russia, among others. In 2010, the company was the recipient of the prestigious Kansas Governor’s Exporter of the Year award at a ceremony held at the Kansas Calvary Encampment in Hays, Kan. The Northwest Kansas Regional Export Promotion Meeting is one of six regional meetings, hosted by the Kansas Department of Commerce and Global Trade Services, Inc., and is part of the ExportNow Kansas Program, aimed at local companies with export potential. The program raises export awareness by connecting communities and businesses to export assistance.